If you've ever speculated how many wonders one cavern can really hold, you wait until you see Spectrum's collaboration with Disney's The Little Mermaid. We're convinced the company that brought us beauty's answer to Mean Girl's iconic Burn Book is on a mission to give Disney fans heart palpitations, because its newest collection is truly that good. 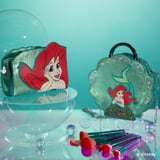 From Ursula vanity cases to mermaid makeup brushes, the collection is filled with gadgets and gizmos a-plenty that will make you feel part of the Ariel's world with one flicker of a foundation brush. Read on to see the fin-tastic collection in full, before its release on May 31.